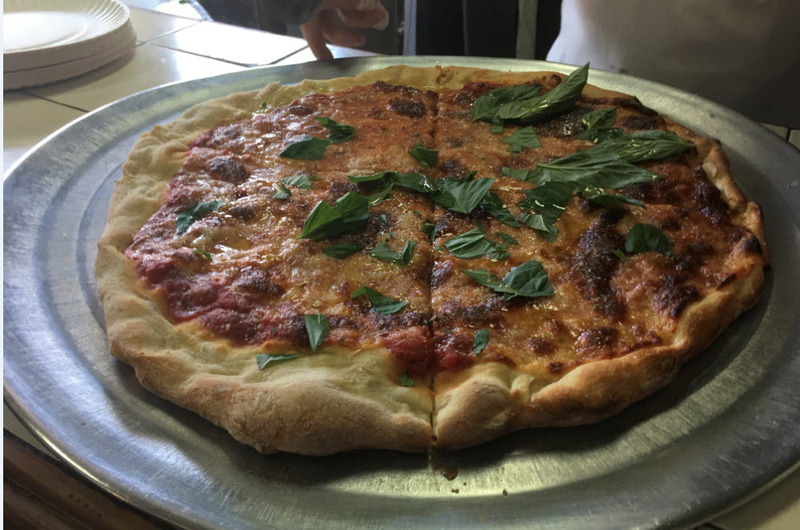 Dom DeMarco is truly one of the Living Legends of Pizza. He is genuine and unassuming. 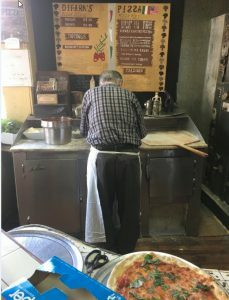 He makes each pizza lovingly by hand. He builds a pizza and uses as a peel to place the pizza in the oven. Then he reaches into the oven with his hand to check on the pizza with his bare hands. He has a little ritual with each pizza he creates. 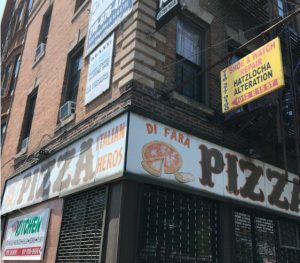 Here is the backstory of the following video: I had my camera when I visited DiFara’s. I leaned up against the counter and started filming. The counter was quite crowded and everyone there wanted to get a glimpse of Dom making pizza. The two things I knew I wanted was to see Dom pull a pizza out of the oven with his bare hands. The other was I wanted to see him grab a bunch of fresh basil and use scissors to cut the basil on the pizza. Thankfully I was able to catch the master in action. We arrived early on a Sunday and knew there would be a line to get in. There was even though we got there an hour and a half before the shop opened we were behind four other people. In line everyone was friendly. About half the people we talked to in line had been to DiFara’s before. There were folks who had driven over from Staten Island. There were people like us, who had taken the train from Manhatten. There were a few pizza fanatics from the West Coast (California), East Coast (Connecticut) as well some folks from the South (South Carolina). There were even some people from Japan who had heard of the pizza. In a way, the line reminded me of other pizza lines I have stood in. It’s like you all belong to an informal club of pizza lovers. You know you are going to have to wait, and you do so patiently. 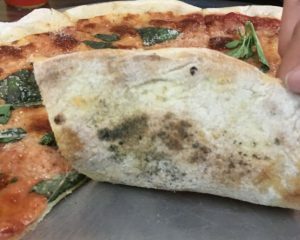 There is a shared mission of knowing you will soon be having incredible pizza. The most amazing thing is you are aware that you are in the presence of greatness. 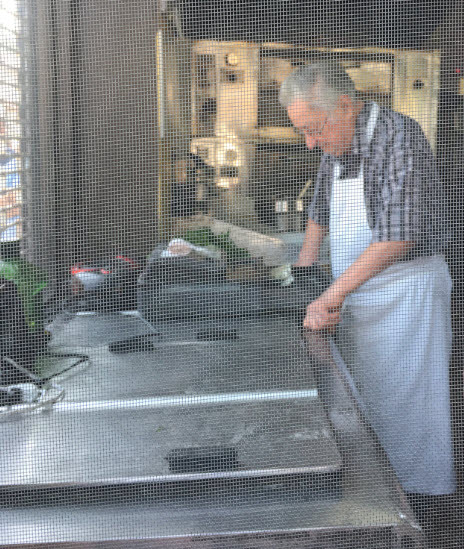 the pizza you are eating has been made by a living treasure. By the time we finished our pizza, there was a long line out the door and around the block. Watching “Dom” building his work of art. it left me in awe, no wasted motion, He was totally one with the pizza he was creating. Making sure the tomatoes went where they should at the right thickness. His treatment of the peel was well worth watching. Thank you for sharing Albert! 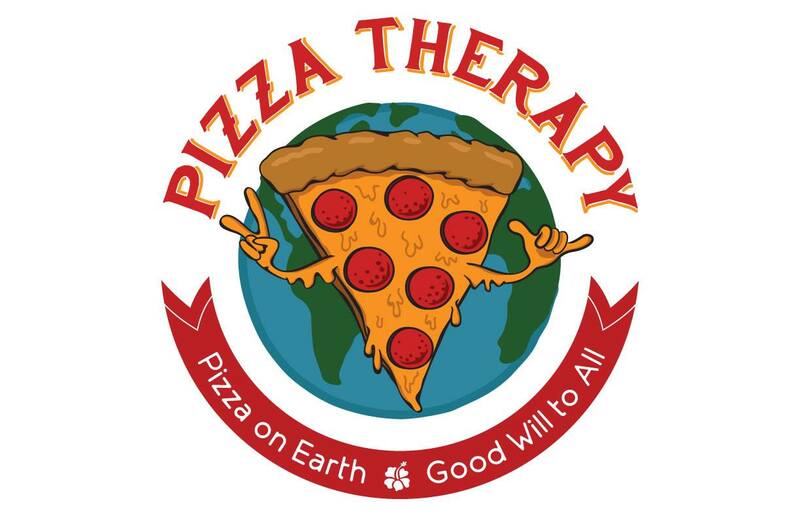 Thank you for your positive pizza energy. 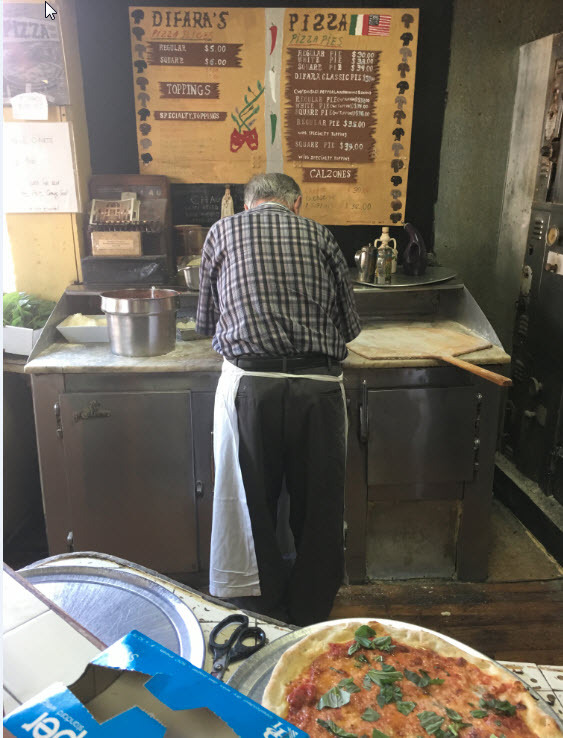 It was magical to watch him make pizza. He did not stop for a second the whole time we were there. He is a living treasure! Thanks, Joe. Watching Dom DeMarco make pizza was extraordinary. The pizza was so simple yet elegant.